I feel like every recipe post starts off with a disclaimer that I am lazy and I only like to make foods that require the least possible effort. Hey, at least I’m consistent. There are a couple complicated baking adventures I will partake in, but they’re certainly not a regular occurrence. In the spirit of quick, better-for-you creations, I want to share my latest snack adventure. I used to be a big lunch meat consumer. I still buy it sometimes, but for the most part I prefer to make meats that are less processed. 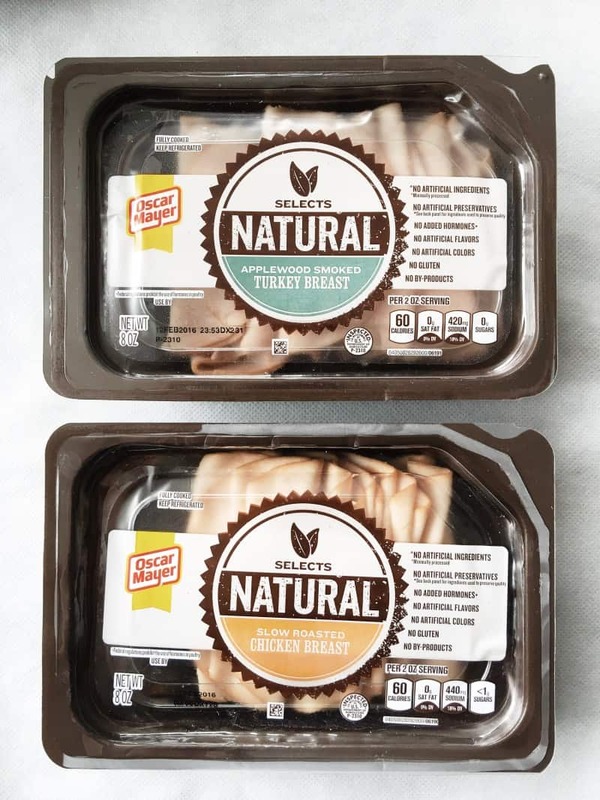 That being said, when I learned about the new line of Selects Natural from Oscar Mayer, I figured they would be worth checking out. Oscar Mayer Selects Natural is made with no artificial ingredients and is minimally processed. There are no artificial preservatives, no artificial flavors, no artificial colors, no gluten and no by-products. For someone who eats a good amount of meat (and a husband who does even more so), it’s important that what I choose to eat be as natural as possible. We have even switched to buying organic, antibiotic-free chicken breasts since it’s something we eat on a regular basis. For today’s recipe, I picked up the Applewood Smoked Turkey Breast and the Slow Roasted Chicken Breast. I loved the labeling and even when I checked the ingredients list, I was surprised at the minimal number. Both options tasted fresh and delicious. When I get hungry in the afternoon, I have a lot of sweet options around: granola, dates and almond butter, fruit, etc. I don’t always plan ahead to make sure that I have balanced options available. I wanted to be able to make a savory snack that incorporated protein, fats, and carbs to leave me feeling full longer. 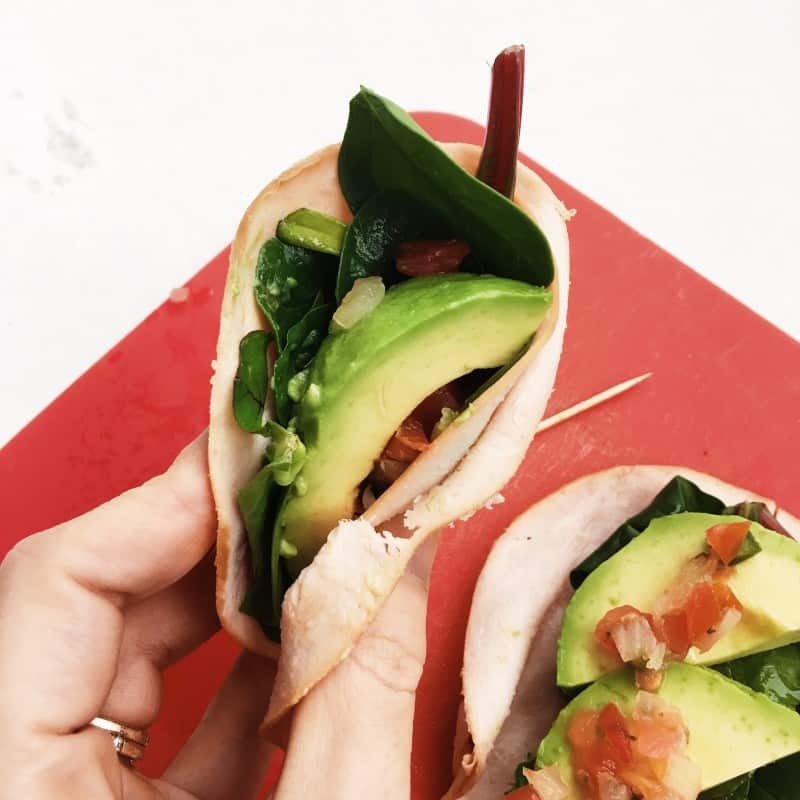 These turkey (or chicken) roll ups were surprisingly easy and surprisingly delicious. 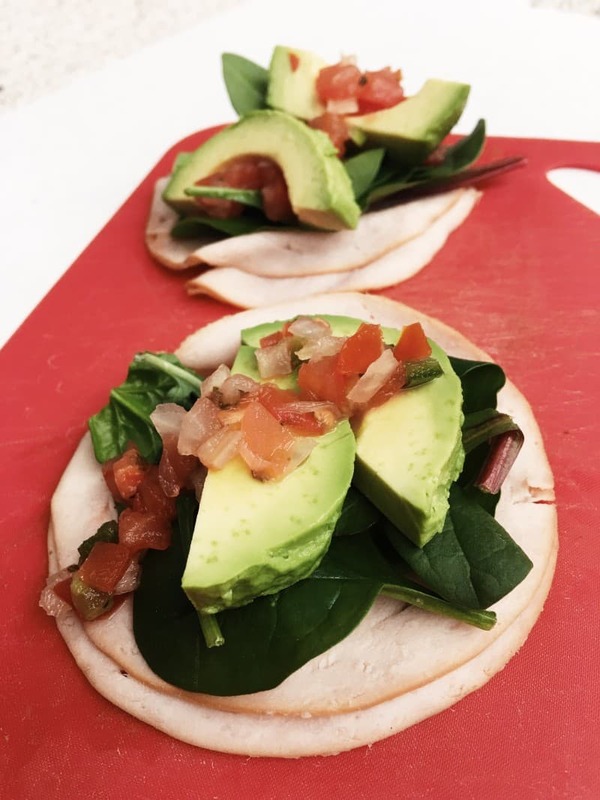 They take virtually no time to throw together and in a matter of minutes you have a wholesome snack that fits into any healthy eating plan. Use two slices of turkey as your base for each roll-up. Add a pinch of mixed greens or spinach to each. 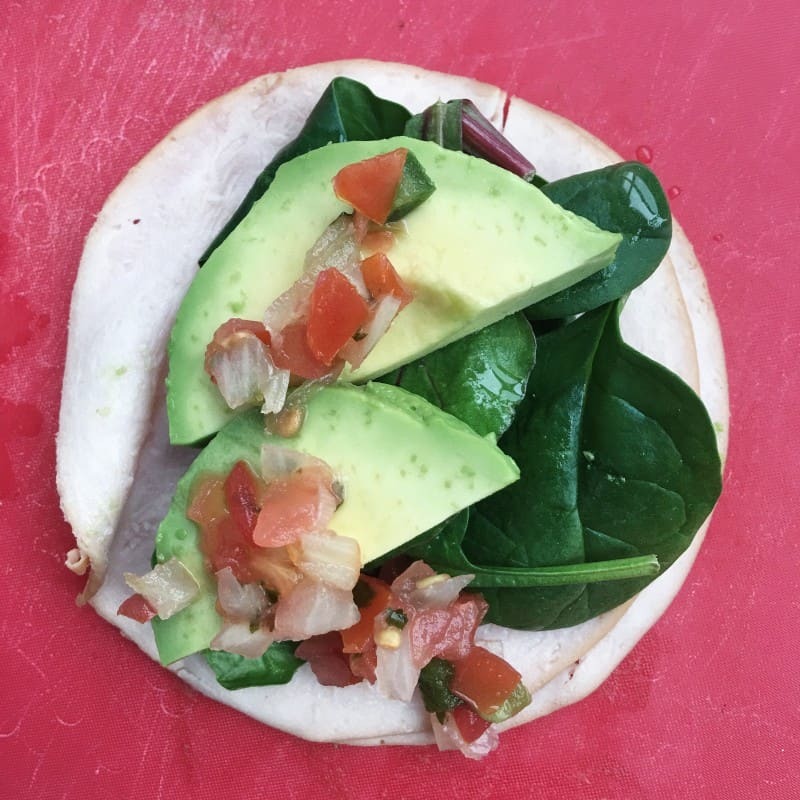 Layer with avocado (2 slices per roll-up) and top with pico or salsa. If you are interested in learning more about the Naturals Select line, you can visit their website here. Happy snacking! What are some of your favorite quick and balanced snack ideas? You know I’m down this! I love playing with food. I eat cold cuts all the time. Well, not now obviously, but that is not my fault! I love them with just about any spread, but also dipping into salsa. This is definitelt my kind of snack. I love my honey ham from the deli even though it is probably not the best for me. I usually eat some ham and cheddar cheese together as a roll up. Love the avocado and pico de gallo combo. Cold cuts used to be my go-to snack/breakfast/lunch/dinner when I was living alone and didn’t like handling raw meat very often. Plain, with Laughing Cow, sometimes on a Wasa cracker, in my salads, whatever. Cold cuts probably got me through a lot of my eating disorder, too, because they were a reliable source of lean protein. Thank you, deli meat! I could house a package of that rotisserie-seasoned chicken breast. I’ll definitely look for it next time I’m at the grocery store! Hahaha I loved that explanation. It tastes really good and I’ve been eating it randomly throughout the day. I only make food that requires almost 0 effort! I just do simple turkey and hummus roll ups! Great minds think alike. If it takes too many ingredients or too many dishes I’m out. I know, the planning can be annoying but it’s so important. Otherwise I just end up gnawing on my arm or eating every piece of candy I see. MMM. When I was little my favorite snack was simply pieces of ham rolled up like that! This is the adult version haha. I was JUST telling my brother (who has totally overhauled his lifestyle and is down 20 lbs!) 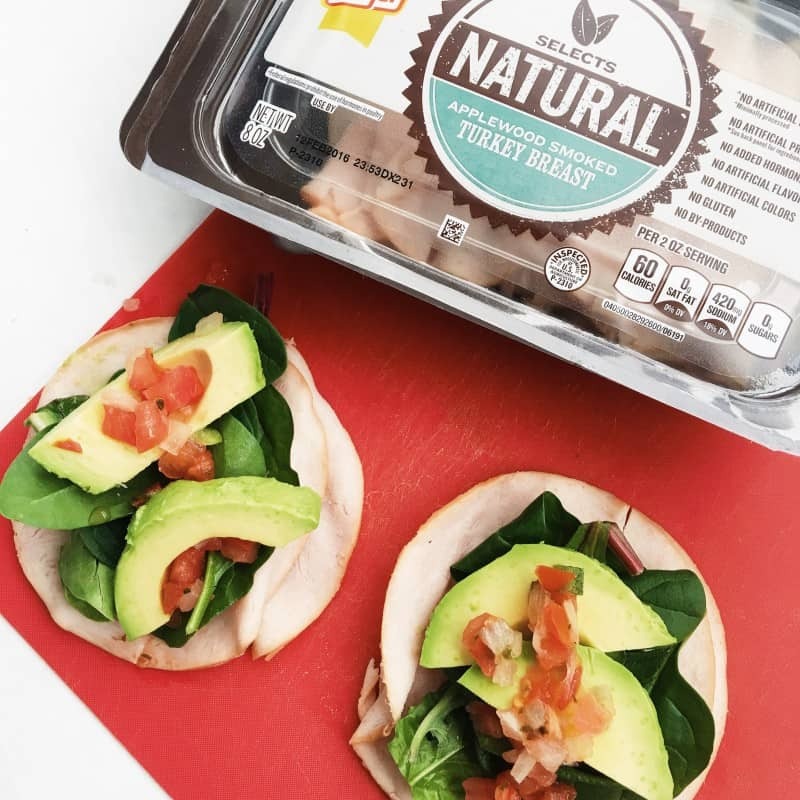 that a great snack idea is turkey-wrapped avocado. Great, great idea!! I’ll take avocado in any form, any time of day. Woo to your brother! That’s amazing! I love deli meat roll ups. My favorites include cheese and hummus or cheese and fruit – simple and tasty. I know they’re so good! I’ll have to look for this brand next time I go shopping. I usually buy Matt the Applewood brand lunch meat because it’s got a great “free of” list, but it’s also kind of pricey. Mmm the applewood smoked turkey sounds FAB! I like quick meals, too 🙂 but cooking can also be therapeutic, and following a recipe with a bunch of prep/cutting can be a good way for me to unwind. HAPPY FRIDAY!